mikepasini.com | Photo Corners | Happy New Year! This year's rendition of Auld Lang Syne, which has become an annual tradition at Photo Corners, features Marie Narelle singing the classic accompanied this year by the Dream Band of bears we found at the local toy store. Hmm, your browser won't join in but you can still download the music. We don't have any biographical data on the bears themselves but we do know a little about Molly Narelle, who lived a good 41 years after this performance. Her real name was Catherine Mary Ryan, the fourth child of John and Catherine Ryan, born Jan 28, 1879 at Combaning station in New South Wales, Australia. She learned to sing at the Presentation convent in Wagga Wagga, making a name for herself by singing for local charities. She married Matthew Callaghan, with whom she had three children before he left her around 1894 to pursue the bottle. She supported herself and her children by teaching music. But she had no classroom. She had to ride to her students' homes on a horse or in a buggy. But a local bishop heard her singing at church and introduced her to the Sydney music circle. She adopted the stage name Marie Narelle and started giving concerts. Irish and Scottish ballads were her specialty. She was a big hit in Ireland and performed in London as well. She was part of the Irish delegation to the St. Louis World Fair in 1904, just 10 years after her husband had abandoned her. She stayed in the states to make wax cylinder recordings for Edison, of which this is one. 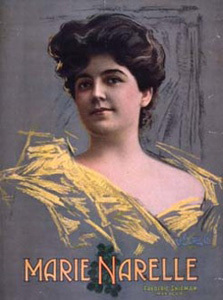 Published by Edison Amerol in 1910 (courtesy of the UCSB Cylinder Audio Archive), Ms. Narelle was a mere 40 year old soprano at time she recorded this tune. She was ultimately granted a divorce from Callaghan and married Harry Allen Currie, a Canadian electrical engineer. They lived in New York, offering hospitality to Australian soldiers passing through during World War I. She moved to England after her husband died. She herself passed away there Jan. 26, 1941. When the churchyard where she was buried was repurposed as a children's playground, her headstone was sent to Australia. On the eve of 2017, we thought you'd appreciate an inspiring story. And Molly Narelle's inspired us. Because what saved Catherine Ryan was Marie Narelle. Her hard work and talent, in short. Those virtues are not always immediately rewarded. But it is the creators in this world who are valuable, not the predators who promise what they can not themselves deliver. May a band of bears and old wax recording remind you how much you matter.